The instructional culture in the College of Arts and Sciences acknowledges the varied processes by which students gain knowledge and encourages active involvement in the learning process. 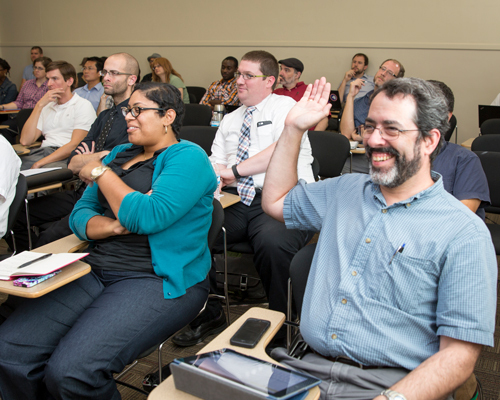 The Active Learning Initiative provides resources — workshops, technology, peer support, and outreach efforts — to help faculty build learning environments that strengthen the capacity of students to gather and synthesize information and develop robust critical thinking skills across disciplines and in a variety of educational settings. Faculty members within the College participate in workshops offered during the fall semester and carrying over into the first weeks of the spring semester. The five-session ALI workshop is designed to encourage an organic approach to the challenges of teaching and learning in the wide array of disciplines within the College of Arts and Sciences that encourages the centrality of active learning — a simple philosophical ideal that encourages learning environments that demand active engagement with material as opposed to passive receivers of information. The concept applies equally to traditional classrooms as well as online environments and is workable in a variety of disciplines and classroom sizes. ALI workshops are led by the Active Learning Initiative Mentors: Patrick Frantom, Jessica Kidd, and Jeff Melton.